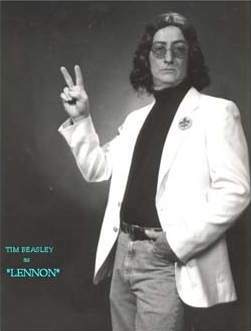 Tim Beasley is a professional John Lennon look alike impersonator and Beatles tribute artist delivering a startling impression of John Lennon. His ability to impersonate John Lennon in all dimensions of voice, looks, personality and actions moves many Lennon and Beatles fans to remark You’re just like Lennon! 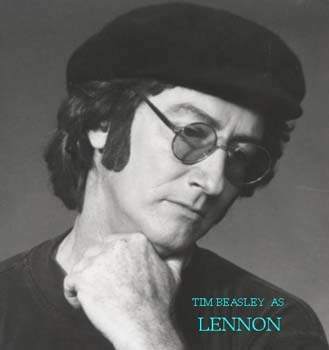 In Lennon Tim Beasley performs selections throughout John Lennon’s vast works, including the early Beatles years of Liverpool, the U.S. invasion, the Summer of Love 60’s and the solo "Double Fantasy" years. The show begins with Tim in mop top, black suit and boots" performing those great rockers from the earlier Beatles albums Meet the Beatles, Hard Day’s Night, Help!, Beatles ’65 and "Rubber Soul." After a brief intermission, the show resumes with Tim in John Lennon’s Abbey Road look of white suit, sneakers and long, center-part hair and granny glasses. The songs are a grand collection from Revolver, Magical Mystery Tour, Sgt. Pepper’s, Abbey Road, The Beatles ( White Album ) and "Let It Be." The obvious ending to the show is John Lennon’s most revered song, Imagine. also nationally for famous venues like The Hard Rock Café Orlando and recently for Clear Channel Entertainment's "Legends Of Rock And Roll".